If the little kids you know haven't quite mastered the skill of sitting quietly at the dinner table or in the car, we suggest packing our convenient Fox and Woodland Animals Art Case for your next restaurant visit or road trip. Decorated with brightly colored woodland animals, the 7½"x10" Velcro-close portfolio contains everything young budding artists need to entertain themselves: six washable markers, a blank notepad, a six-pack of colored chalk, and four chalk-friendly "pages" that can be wiped clean (with a special included eraser cloth) and doodled upon time and time again. 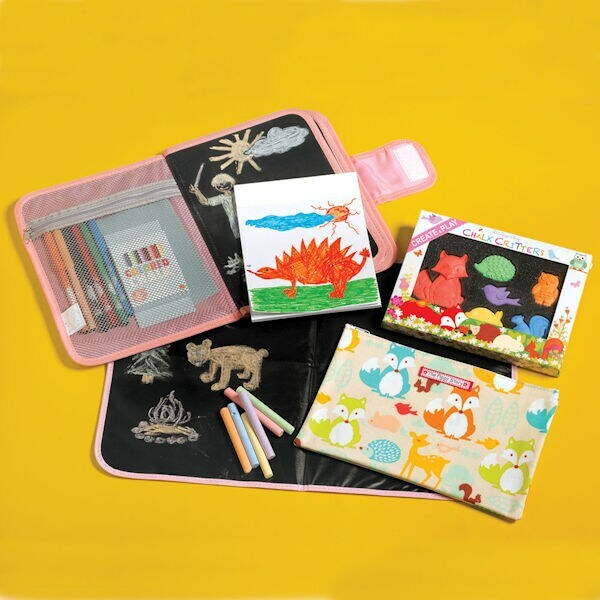 And for at-home dinners, children will love drawing pictures on the 12"x17¾" Table Mat, a vinyl-coated placemat featuring cute critters on one side and a reusable chalk "canvas" on the reverse (six pieces of chalk and travel pouch included). Amp up the fun with our pack of six Chalk Critters (featuring a fox, an owl, a squirrel, a rabbit, a bird, and a hedgehog carved from colorful chalk). What creative - and battery free! - alternatives to electronic screens! For ages 3 and up.